It's Christmastime and Flavia de Luce, 11, is anticipating the arrival and capture of Father Christmas, using a concoction whipped up in her fully equipped laboratory, her Sanctum Sanctorum, designed to hold him fast to the rooftop chimney till she can get there. Once and for all the question of Father Christmas's existence will be answered for Flavia, and what older sisters Daffy (Daphne) and Feely (Ophelia) told her will either be right or wrong. But before that can happen on Christmas eve, the ancestor home, Buckshaw, is going to be used as a movie set in order to make some money to keep Her Majesty's taxman at bay. After the movie crew gets itself settled in at Buckshaw, the vicar, Rev. Richardson, asks the movie's leading lady, Phyllis Wyvern, if she would put on a performance with her leading man, Desmond Duncan, to raise money to help pay for roof repairs at St. Tankred's. The plan is that they will do a scene from Shakespeare's Romeo and Juliet. Because the roof is already caving in, it is decided that the performance would be done at Buckshaw and, since there is already considerable snowing falling, the good folks of Bishop's Lacy will be brought in by sleigh and tractor. As the performance begins, the falling snow increases to blizzard proportions, and by the end of the performance, the snow has stranded everyone at Buckshaw. As everyone settles in for the night, sleeping on the floor scattered all around, upstairs Flavia decides to go have a midnight chat with Phyllis Wyvern. Approaching her bedroom door, Flavia can hear a confusing slap-slap sound coming from the actress's bedroom. Pushing the door open, she discovers a film projector going round and round and then she sees that Phyllis Wyvern is wearing the peasant blouse and skirt of one of her old movies - Dressed for Dying - and has been murdered, strangled with a piece of film from the movie and then tied in a big bow around her neck. Naturally, Flavia manages to insinuate herself into the investigation once Inspector Hewit of the Hinley Constabulary is brought in,(and after doing her own initial investigations), yet this novel isn't about Flavia's sleuthing skills so much as it is about the de Luce family, past and present. We are given more background information about the de Luce's, about Flavia's mother Harriet and how much her parents loved each other before Harriet's accidental death. And, even sisters Daffy and Feely aren't as mean to Flavia as they normally are, especially when she almost becomes the victim of her own plan to discover the truth about Father Christmas. Bradley has created a very Agatha Christie-like situation involving an isolated country house full of suspects that can't easily get away from the scene of the crime. And there are suspects galore, but why would any of them want Phyllis Wyvern dead? Flavia naturally discovers, Phyllis Wyvern has secrets, lots of them. Some involve the war, some involve her family and others involve professional jealousies, and Flavia is determined to get to the bottom of them all. I've loved the four Flavia de Luce mysteries I read so far, and, even though I haven't read them in order, it hasn't been a problem. Bradley gives enough information in each book to inform without over doing it. 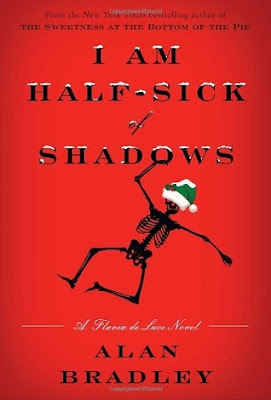 And I like that Bradley has included a Christmas book in his Flavia novels, it gives it a more rounded feeling. This isn't one of the best Flavia book but it is a nice holiday mystery. And I am anxiously awaiting Flavia #8 - Thrice the Brinded Cat Hath Mew'd. I love this series, though I have to admit that I can't recall much about the mysteries in each book. It's Flavia, her relationships, and her world that I love. I know what you mean, Gail. I also love the series, but don't really remember the mysteries. I think that's why I liked this book better than others - as I said, not much mystery, lots of family and Buckshaw stuff.